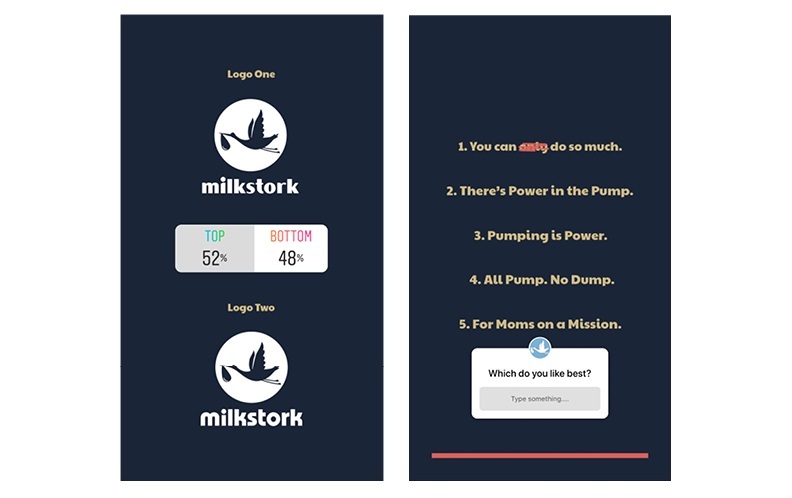 Milk Stork attained 331% more impressions on Instagram story. Milk Stork is the first ever breast milk shipping company for the business traveling, breastfeeding mom. It is a working mom made company, made for working moms and was established in 2014. Over the past four years, Milk Stork has grown and gotten more support from not only mom’s around the country, but also prominent companies who want to support working families. Our client has been looking to undergo a rebrand and decided to allow their faithful followers to share their input on a few elements of the brand. We created an interactive Instagram story to let mom’s share what they loved most. The story began with an introduction and call to action. We wanted our community to feel involved and a part of Milk Storks’ future. Next, we had viewers vote on which logo they liked best out of two, using the voting feature on Instagram. The viewers also got to choose between five different tag-lines by typing their response via the question and answer feature on Instagram. Full story can be seen here. We used Iconosquare, to track how the story was doing throughout the 24 hours it was visible on Instagram. While this is nothing new, it is another example of how loyal followers love to be a part of the brand in a personal way. Allowing your community to be involved in the brand’s decision making process on business, brand, and even product enables a special connection to take place between the consumer and the company. Co-creation though social media tools also allows the brand to have a deeper understanding of their consumers tastes and this data can help the brand more accurately predict what products might move the needle financially. Our client Dr. Jon Marashi, dentist to the stars & Hollywood's best kept secret wrote an article that was featured in Thrive. 1.) Storytelling: The O’Byrne team wrapped the idea of owning this home into a larger, more compelling narrative. People like sharing information, but people love sharing stories. 2.) Aspirational: One can put themselves into the home viewer’s shoes and see themselves living this lifestyle. Benefits prevail over features, because features don’t grab you, benefits do. This home viewing method showcases the benefits up-front. 3.) Sharable: Because the video is humorous, it becomes more shareable. Humor is a sense of physiological arousal. Arousal is a state of activation and readiness for action. When we feel excited, we want to do something (or in this case share something) rather than sit still. The creativity in this video is one of the major reasons why the O’Byrne team is currently approaching almost 1 billion dollars in sales to date. These nice gentlemen came looking for tacos...we think. Please call 702-385-5555 - LVMPD Crime Stoppers - with any information or tips related to this crime. Burglary occurred at 3:33 AM on Wednesday, December 16, 2015 at 7000 W. Charleston Blvd. in Las Vegas, NV. Sephora organized a Snapchat Sweepstakes. Participants snapped a selfie and used the Snapchat drawing tool to add cartoon eyebrows. Then they uploaded those submissions to Instagram and tagged them with #SephoraSnapsSweeps; the randomly chosen winner won a $500 gift card. Result: The campaign boosted traffic and engagement not only on Snapchat, but also on Instagram, where the contest hashtag was used over six thousand times. Posts tagged with #SephoraSnapsSweeps garnered 10% more comments than the average Index brand. H&M launched a digital “treasure hunt” in Poland. The retailer hid exclusive party tickets in its clothing stores and sent out clues via Snapchat, in what was the country’s first Snapchat marketing campaign. Result: Only about 200 people played the game, but the positive media attention didn’t hurt. The campaign reached almost four million users and boosted H&M’s Snapchat following by almost a thousand.